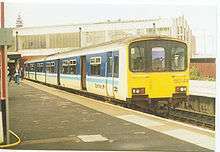 The British Rail Class 150 "Sprinter" diesel multiple-units (DMUs) were built by BREL York from 1984 to 1987. A total of 137 units were produced in three main subclasses, replacing many of the earlier first-generation "Heritage" DMUs. At the beginning of the 1980s, British Rail (BR) had a large fleet of ageing "Heritage" DMUs built to many different designs in the late 1950s and early 1960s. Some of the more reliable types were retained and refurbished. BR decided to replace many of the non-standard or unreliable types with new second-generation units, built to modern standards. Two different types were developed; low-cost "Pacers", built using bus parts and intended for short-distance services; and "Sprinters", based on BR's Mark 3 bodyshell design, for use on longer-distance services. In 1984, BREL built two prototype 3-car Class 150/0 units, numbered 150001 and 150002. 150001 was fitted with Cummins engines and Voith hydraulic transmission, and 150002 was fitted with Perkins (Rolls-Royce) engines and Self-Changing Gears mechanical transmission. The design specifications of the prototypes were similar to the later production units, but they were to remain as the only Class 150s to be built as 3-car units. Additional three-car units were created later by re-marshalling a 150/2 car in the middle of a 150/1 set, but only the prototypes had purpose-built centre cars without driving cabs. Both cab doors are air-operated unlike the Class 150/1 production model, but as seen later on in the 150/2 variant. 150002 proved to be the worse of the two for reliability and was consequently chosen for use as the testbed for the Class 158, being re-geared to a maximum speed of 90 mph (140 km/h) and fitted with Cummins engines and Voith transmission and a Class 158 interior. One car was fitted with the Class 151 Twin Disc 'hot-shift' transmission which it used successfully once the control software was sorted out. To distinguish this unit it was reclassified as the Class 154. It has since been returned to the standard configuration and reverted to its original number. Both prototypes were still in service with London Midland until 2011. 150001 entered service with First Great Western in January 2012, with 150002 to follow after refurbishment and relivery. They are now used primarily on the Reading-Basingstoke line, with 150002 in the old First Great Western livery & 150001 in the new Great Western Railway green livery. At the same time that BREL built the 150/0s, Metro-Cammell built two prototype Class 151 units at its Washwood Heath plant. [note 1] The two types of unit were exhaustively tested, with a view to placing further orders for the more successful. In the event, the two Class 150 units proved to be more reliable, and as a result an order for 50 two-car units was placed with BREL. This second batch of fifty units were classified as Class 150/1 and numbered in the range 150101-150. Like the prototype units, they did not have front-end gangway connections. Originally based at Derby Etches Park depot, these units were introduced in 1986, mainly concentrated around Birmingham and Manchester, and in later years were restricted mainly to commuter services. The final batch of 85 two-car units were built with front-end gangway connections, which allowed passengers to move between two units that were working in multiple. These units were classified as Class 150/2 and numbered in the range 150201-285. They were used on longer-distance services. The end gangways make them very similar in appearance to the Class 317/2 EMUs, also based on the Mark 3 bodyshell. Some of the Class 150/2 units were later disbanded, and the vehicles were used to make some of the Birmingham and Manchester-based Class 150/1 units into 3-car sets. The units in Manchester were later returned to their original configuration, but the Birmingham-based units were renumbered into the 1500xx range by subtracting 100 from the previous number (e.g. 150103 became 150003). This also gave an extra operational advantage of there being an extra set of passenger door controls within the train for use of the Guard, this made it easier for them to collect revenue on the train without having to run the full length of the unit to release the doors at a station. The 450 Class is built using the Class 150 bodyshell and is operated by Northern Ireland Railways. One further unit was built specifically for testing duties. Originally numbered in the Class 180 series, the unit is now in the departmental Class 950 series, numbered 950001 and carries the yellow Network Rail livery. The Class 150 units have BSI couplers which enable them to work in multiple with Class 142, Class 143, Class 144, Class 153, Class 155, Class 156, Class 158 and Class 170 units, as well as units of the same class. However, they cannot work in multiple with Class 165 or Class 166 units due to incompatible wiring arrangements. When introduced, the Class 150s had unique interior door open/close buttons that were square, blue in the North of England/Southern Scotland and Yellow/orange in the south, and lit up turquoise in the North or bright yellow in the South of England/Wales when the doors were enabled. The illumination feature was intended to aid visually impaired people, although they did not meet current standards set out by disability regulations because they had no raised braille and are too small for some disabled people to locate. After privatisation, North Western Trains (which was taken over by First North Western shortly afterwards) and Arriva Trains Northern operated Class 150/1 and 150/2s on their routes. The North Western Trains units underwent refurbishment by Hunslet-Barclay in Kilmarnock. When Northern Rail took over, both the former NWT and ATN Class 150s were transferred to Newton Heath depot, Manchester, with the former North Western Trains Class 158s taking the 150s' places at Northern's Neville Hill depot (Leeds). All Northern 150s contain high-density 2+3 seating. During late 2011, Northern received various ex London Midland 150/1s and 150/2s when the brand-new Class 172 units entered service in the Midlands. This has enabled Northern to lengthen more of its most overcrowded services. The new Northern franchise will receive the Angel Trains 150/0s and 150/1s currently leased by GWR. These will start transferring North in September 2017 and finish in April 2019. Northern has announced that 24 of their class 150 units will be reformed into 3 car units by March 2019. The 3 car sets will be used on routes including the Penistone Line and Leeds to Goole. Wessex Trains unit 150243 at Bristol Temple Meads. These units were later transferred to First Great Western. After British Rail was privatised, the fleet passed to Porterbrook Leasing who leased the trains to Wales & West, which was later split up into Wessex Trains and Wales & Borders (later Arriva Trains Wales) in 2001. The 25 Wessex Trains Class 150/2 units served regional services in South-West England. They were used on a wide variety of local services, including: the Wessex Main Line; Bristol-Southampton, Heart of Wessex Line; Bristol-Weymouth, Golden Valley Line; Cheltenham-Swindon, Tarka Line; Exeter-Barnstaple, Avocet Line; Exeter-Exmouth, Riviera Line; Exeter-Paignton, Looe Valley Line; Liskeard-Looe, Atlantic Coast Line, Cornwall; Par-Newquay, St Ives Bay Line; Penzance-St Ives, Tamar Valley Line; Plymouth-Gunnislake and the Maritime Line; Truro-Falmouth service. They also worked some longer-distance services over the Great Western Main Line and South Wales Main Line between Cardiff, Bristol, Exeter, Plymouth and Penzance. The units were refurbished by Wessex Trains; improvements included: Installation of DPTAC 'easy to see, easy to press' tactile Passenger Door Control buttons, non-slip vinyl flooring, high-backed seats in a 2+2 arrangement, and refurbished toilet area. The units were again refurbished by FGW with CCTV being fitted. On 10 December 2006, the fleet was reduced by eight, the others being handed to Arriva Trains Wales. 15 additional Class 150/1 units were expected for the region in 2009 but these were delayed until late 2010 - late 2011, due to the late delivery of the Class 172s from Bombardier. These were due to be six from London Overground and nine from London Midland. These units replaced Class 142 Pacers and the Arriva Trains Wales Class 150 Sprinters, The single Class 158 on weekly hire from South West Trains, and the Cardiff to Weston Super Mare and Paignton loco-hauled services. The 158 and loco-hauled diagrams were withdrawn first. By mid-October 2010, ex-London-Overground Class 150120, 150123, 150129, 150130 & 150131 had arrived at First Great Western's St Philips Marsh depot Bristol for a unit refresh and preparation for entry into service with First Great Western. In mid-November, 150120s/123/129/130/131 entered into service, with 150128 due to enter service soon after. All ex-London-Overground 150/1s retained their ex-Silverlink livery until refurbishment. By February 2011, 150121 & 150127 had been refreshed internally and externally by Pullman Rail at Cardiff Canton TMD, including a repaint into First Great Western plain blue and rubine red livery. In early 2012 these were converted to three-car sets by adding a carriage from a former Central Trains 150/2. These were renumbered 150921 and 150927 in July 2012. The two prototype 3-car Class 150/0 units transferred from London Midland have replaced the Class 165 and 166 Turbo units currently used by Great Western Railway on the Reading to Basingstoke Line, which allowed the Turbo units to reinforce Thames Valley services. 150001 entered service in January 2012. Table 122 of the Winter 2012/2013 National Rail Timetable shows all FGW services on this route to be standard-class only. Due to fire damage on car No.52221 of Class 150/2 unit 150221, 153369 was temporarily joined up with surviving car 57221, and the formation renumbered 153399. This hybrid has now been disbanded, as car No. 52221 has been repaired. The repair was undertaken at Laira (LA) depot in Plymouth. The following year 153369 was made into an hybrid again and joined up with half of 150202 in Central Trains livery and also renumbered 153399, as the other half of 150202 was undergoing repairs after being damaged in a derailment at Westbury. This hybrid is also now disbanded. In 2014 150921 & 150927 lost their centre 150/2 coach so they could be overhauled and they were re-numbered back to 150121 & 150127, after the centre 150/2 coaches were overhauled they were placed into 150125 & 150126 which became 150925 & 150926. By January 2016, 150232 had been repainted into the brand new GWR livery, after First Great Western re-branded itself. This new livery consists of a dark green body, grey doors and the GWR logo on the front and rear of the train. In April, 150247 emerged in the new livery but unlike 150232 it has been fitted with the new GWR interior. Following privatisation, Wales & Borders continued to use the fleet of Class 150 units on branch-line services as well as on the commuter services around Cardiff known as the Valley Lines and the Vale of Glamorgan Line. 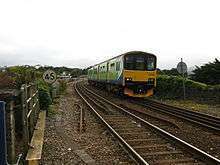 They have also been used on the Borderlands Line between Bidston (Merseyside) and Wrexham and on the Conwy Valley Line, when a single car Class 153 does not provide sufficient capacity. The Wales & Borders franchise passed to Arriva Trains Wales, which progressively built up its fleet of Class 150s with units acquired from various other franchises. The first expansion of the fleet was in May 2005, when twelve First ScotRail units moved to Arriva. On 10 December 2006, Arriva Trains Wales received eight further Class 150s from First Great Western (in ex-Wessex Trains livery), as part of a national fleet shuffle. In November 2007, ten Class 150/2 units were transferred from the West Midlands as the Central Trains franchise came to an end. In 2008 five of these units were sub-leased to First Great Western to allow several Class 158s to be reformed into 3-coach units to provide extra capacity on Portsmouth Harbour-Cardiff services. During the strikes by London Midland staff in early 2011, some Arriva Trains Wales 150s were used on the Wolverhampton to Shrewsbury Line to cover the gaps in service left by cancelled 170 London Midland trains. Central Trains/Centro refurbished Class 150/1 Sprinter No. 150014 at Birmingham Moor Street. Following privatisation of British Rail both Silverlink and Central Trains operated Class 150s in the midland regions of England and both companies were run by bus company National Express. 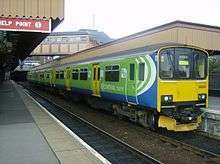 The Central Trains Class 150 units were mainly used on regional services around the Midlands; they were also used on the Birmingham to Lincoln, Derby to Matlock, Nottingham to Worksop, and Crewe to Skegness routes. When Network West Midlands was launched by Centro, some units were repainted into the new livery (as seen in the photo). Some were also partly grouped into 150/1 and 150/2 combined units, having 150/1 ends and a 150/2 unit as a centre car. In November 2007, London Midland acquired much of these routes as part of the franchise change and inherited the Class 150 units used previously by both of these companies. London Midland's then-large fleet included the two prototype units 150001 and 150002, more than half of the 150/1 sub-class, and a number of examples of 150/2. Based at Tyseley depot in south-east Birmingham, the units were concentrated on local stopping and semi-fast services on the Snow Hill Lines - Great Malvern, Worcester, Kidderminster and Stourbridge, along the Jewellery Line to Birmingham Snow Hill, then on to Shirley and Stratford-upon-Avon, or Solihull and Dorridge. They were also used less frequently on services to Leamington Spa, over the Lickey Incline between Worcester and Birmingham New Street and on services to Rugeley Trent Valley. In 2010 London Midland ordered Class 172 replacements for its class 150s. It initially hoped to retain some of the 150s as additional capacity, although they were also wanted by First Great Western and Northern Rail. London Midland was expected to lose all of its Class 150s, but a change in plan saw it retain three Class 150 vehicles as additional capacity, following a statement from the Department for Transport on 10 August 2011. However, London Midland lost two Class 153s to First Great Western as a result. As of November 2012, the three remaining class 150 units with London Midland (150105, 150107, 150109) have been repainted in London Midland livery; these are primarily used on the Bedford to Bletchley line. Upon the privatisation of British Rail, the bus company National Express ran ScotRail, and its successor First ScotRail, operated 18 Class 150s out of Edinburgh Waverley on Fife Circle services. Other workings included Dundee and Carnoustie, as well as operating alongside other DMUs such as Class 158s on the Crossrail services between Newcraighall through Edinburgh to Bathgate, Stirling, Dunblane and occasionally Perth. In May 2005 all 18 units were transferred to Arriva Trains Wales. Anglia Railways unit 150217 stabled at Ipswich in 2004, still carrying Regional Railways livery ten years after privatisation. Upon the privatisation of British Rail with the creation of Anglia Railways, initially inherited a small fleet of nine Class 150/2 units, later supplemented with a tenth. The units were based at Norwich Crown Point depot, and put to use on rural services in Suffolk and Norfolk. Lines using the units included the Bittern Line, the East Suffolk Line, and the Wherry Lines, as well as services from Ipswich to Cambridge. One unit each weekday was sub-leased to First Great Eastern for use on the Sudbury Branch Line. Upon the privatisation of British Rail with trains run by bus company National Express under Silverlink. 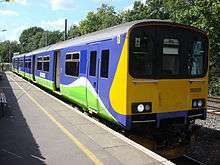 The former North London Lines franchise operator, Silverlink, had eight Class 150s; seven of the units were originally cascaded from Central Trains following delivery of new Turbostar units in 2000. They replaced the ageing fleet of Class 117 and Class 121 units. The eighth unit, no. 150121, was transferred to Silverlink in late 2005. London Overground, which took over the North London Line, inherited the eight Class 150/1 units. Six of these were employed on the Gospel Oak to Barking Line, while two were sent on long-term loan to First Great Western. All units had names. The majority of the names are references to the Marston Vale Line on which they operated during Silverlink's franchise. Leslie Crabbe was a long-standing railway employee, who worked on the route. Richard Crane is the chairman of the Bletchley to Bedford Rail Users Association who has campaigned for the line to be retained and expanded. Three of the names (marked with an asterisk) were inherited from the previously incumbent British Rail Class 121 units. All the units are now with First Great Western, and their names are no longer applied. By the end of October 2010, all London Overground's Class 150/1s had been replaced by a new fleet of eight two-car Class 172 units operating exclusively on the Gospel Oak to Barking Line. Their final use was on 28 October 2010 when unit 150128 formed the 19:02 Barking to Gospel Oak service. The six units were cascaded to First Great Western, together with nine of the London Midland fleet. Class 150/0 Great Western Railway 2 1984 3 150001 - 150002 Used on the Reading shuttle services. On 11 November 1988, 150 209 derailed at St Helens Central, Merseyside. The train struck the abutment of an overbridge, crushing the leading cab and killing the driver. Sixteen passengers sustained minor injuries. On 12 July 2012, 150 217 collided with cattle at Letterston, Pembrokeshire and was derailed. There were no injuries amongst the 30 passengers and crew on the train. On 7 November 2015, units 150 133 and 150 204 formed a passenger train that was derailed near Knaresborough due to a signalman's error. On 3 April 2016, 150 219 collided with a stationary InterCity 125 train at Plymouth. Thirty-five people were injured, both trains were damaged. ↑ Further information about the testing and early days of the 150 prototypes with links to the 151s and 154 DMUs at "Archived copy". Archived from the original on 22 August 2006. Retrieved 2006-08-14. ↑ The previous name, Bletchley Seven, referred to the original fleet of seven Class 150/1 units in the Silverlink fleet. 1 2 3 4 5 6 7 8 "Class 150". The Railway Centre. Archived from the original on 9 March 2005. 1 2 3 4 5 Vehicle Diagram Book No. 220 for Diesel Multiple Unit Trains (Railcars) (PDF). Barrowmore MRG. Derby: British Railways Board. 1982. DP230, DP231, DP238, DP239, DP242, DP243, DR202, DR203. ↑ "The Northern Interim Franchise Agreement" (PDF). gov.uk. Retrieved 22 April 2015. 1 2 3 "First Great Western: Regional Train Fleet". Archived from the original on 20 October 2011. Retrieved 29 April 2010. ↑ "Class 150/2 overview" (PDF). Porterbrook Leasing. Archived (PDF) from the original on 15 April 2012. Retrieved 9 August 2010. ↑ "Mechanical And Electrical Coupling Index". Rail Safety and Standards Board. Diesel and Diesel Electric Multiple Units. Archived from the original on 21 December 2013. Retrieved 20 December 2010. ↑ St John Thomas, David; Whitehouse, Patrick (1990). BR in the Eighties. Newton Abbot: David & Charles. ISBN 0-7153-9854-7. ↑ "EAO Series 56". Archived from the original on 7 July 2007. ↑ McMurray, Gareth. "fleet lists: class 158". thejunction.org.uk. Archived from the original on 5 February 2012. ↑ "Thames Valley and West Country Rail passengers in line for extra seat boost" (Press release). Department for Transport. 22 November 2011. Retrieved 9 January 2014. ↑ "Class 150s start work between Reading and Basingstoke". Railways Today. 1 February 2012. Retrieved 29 May 2012. ↑ Network Rail (3 December 2012). GB Rail Timetable Winter Edition 13: 9 December 2012 - 18 May 2013. TSO. ISBN 978-0117081376. 1 2 "Railway carriage usage" (PDF). Department for Transport. 24 January 2011. ↑ McMurray, Gareth. "fleet lists : class 150". thejunction.org.uk. Archived from the original on 8 February 2012. Retrieved 9 January 2014. ↑ "Bedford to Bletchley Rail Users' Association". 10 June 2009. Archived from the original on 28 February 2010. Retrieved 9 January 2014. 1 2 "AbRail Rail Databases - Diesel Multiple Units". Retrieved 31 July 2016. ↑ "Report of a train accident that occurred on 11 November 1988 near St Helens Central Station in the London Midland Region of British Railways" (PDF). Health and Safety Executive. July 1992. Retrieved 7 April 2016. ↑ "Train derailment near Letterston Junction, between Clarbeston Road and Fishguard, 12 July 2012" (PDF). Rail Accident Investigation Branch. Retrieved 6 April 2016. ↑ "Collision between train and tractor". Rail Accident Investigation Branch. 2 June 2015. Retrieved 6 April 2016. ↑ "Derailment near Knaresborough". Rail Accident Investigation Branch. 19 November 2015. Retrieved 6 April 2016. ↑ "Derailment at Knaresborough 7 November 2015" (PDF). Rail Accident Investigation Branch. Retrieved 4 August 2016. ↑ "18 injured in 'low impact' Plymouth train crash". BBC News Online. Retrieved 3 April 2016. ↑ Lewis-Herald, J (3 April 2016). "Plymouth train crash: Investigation launched after 18 left injured by 'low-speed' collision". The Herald. Local World. Retrieved 4 April 2016. ↑ "Collision at Plymouth station". Rail Accidents Investigation Branch. Retrieved 18 April 2016.